Why "century?" Because you are looking at my 100th stormtrooper photo! 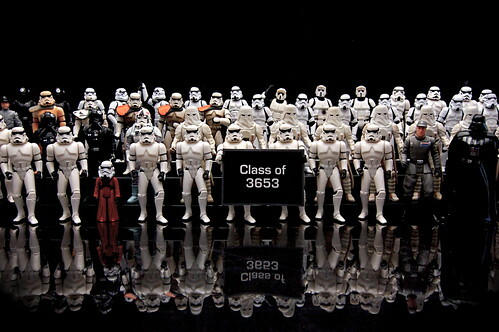 For this occasion, I wanted to capture more stormtroopers at one time than I've ever photographed before, and a class photo seemed appropriate. I had toyed with the idea of taking a photo like this at the end of my Imperial Art Appreciation series, so now I imagine this is that class of recruits who graduated just before the Battle of Endor. I also timed the photo to coincide with the last day of the "White" theme in the 7 Days of Shooting group. 7DOS has been an inspiration for many of my stormtrooper photos. The group is populated by a wonderful bunch of photographers, and I encourage anyone who is interested in a weekly theme group to check it out. Special thanks to my daughter who helped me gather, organize, and set up all these guys. Finally, to answer an obvious question, no, this is not all of my stormtroopers. Believe it or not! Submitted to the Flickr group 7 Days of Shooting. Part of my Stormtroopers series.